From Goodreads: Lady A is the most notorious blackmailer in the city. With just a mask and a gown to disguise her, she sweeps into lavish balls and exclusive events collecting the most valuable currency in 1725 London - secrets. But leading a double life isn't easy. By day Lady A is just a sixteen-year-old girl named Arista who lives in fear of her abusive master, Bones, and passes herself off as a boy to move safely through the squalor of London's slums. When Bones attempts to dispose of his pawn forever, Arista is rescued by the last person she expects: Jonathan Wild, the infamous Thief Taker General who moves seamlessly between the city's criminal underworld and its most elite upper circles. Arista partners with Wild on her own terms in the hopes of saving enough money to buy passage out of London. Everything changes when she meets Graeden Sinclair, the son of a wealthy merchant. Grae has traveled the world, has seen the exotic lands Arista has longed to escape to her whole life, and he loves Arista for who she is - not for what she can do for him. Being with Grae gives something Arista something precious that she swore off long ago: hope. He has promised to help Arista escape the life of crime that has claimed her since she was a child. But can you ever truly escape the past? 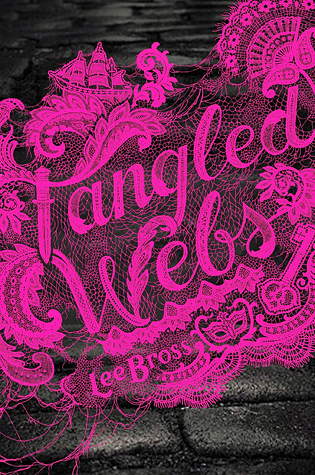 Thoughts on the Novel: When I decided to read Lee Bross’ Tangled Webs, I thought I’d be getting a story with a badass heroine. Instead, I got a protagonist who was constantly thinking about romance! Right from the start, I had a bad feeling about Arista as a character. In chapter 1, for example, rather than being focused on her job, Arista daydreams about what it would be like to kiss her bodyguard and best friend, Nic – that is, until she meets a mysterious stranger who she instantly connects with. From here on, the story became one of insta-love with a bit of a love triangle thrown in. Unfortunately, the hardened street rat I was expecting never showed up! In addition, although Tangled Webs’ setting was London in 1725, there was very little detail devoted to the setting. This story could have easily been set elsewhere or in another time period and still remained the same. Tangled Webs was released by Disney Hyperion in June 2015. Comments About the Cover: I like how if you look closer at the cover, you can see little illustrations of things that are significant in the book. In exchange for an honest review, this book was received from the publisher (Disney Book Group) for free via NetGalley. Going to take a pass on this one. I was hoping the "heroine" would show up not some girl who only has romance on the brain. Hmm, that's definitely not my kind of protag either. Maybe I could have been more into an MC like that when I was younger, but then again - is that the kind of female protag that young girls should be exposed to? Oh, that's disappointing.. :( This book was on my TBR list but don't think I will be reading it anymore.. I hate it when the MC has no character and that too with Insta-love!! UGH!